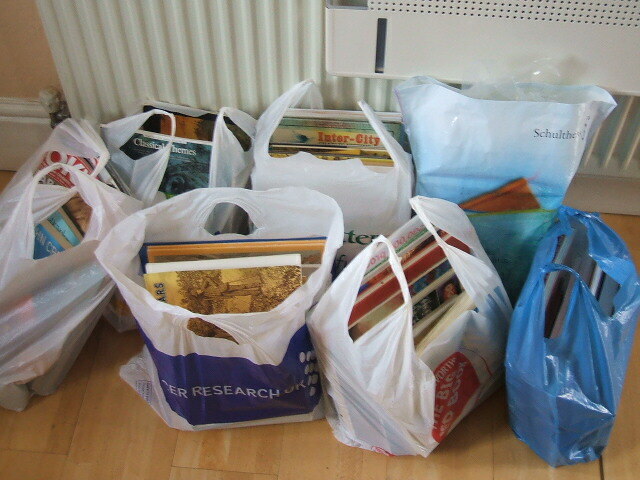 Some charity sack collections will still accept books. This little lot are all destined to be put out for the PDSA tomorrow morning. We get a lot of charity sacks put through the door here but 95% of them only want you to donate clothing. I very rarely have any clothing to donate so I'm afraid the sacks end up in a pile in a drawer and will probably only be used when we next move house. Books, on the other hand, I have in abundance and they are much more problematic to dispose of. I have tried taking them bag by bag to the local charity shops where in one of them I was told in no uncertain terms that they didn't want any more books. Sadly for that particular charity shop, such was the rudeness of the refusal of my donation that I shall never donate anything there ever again. If really pushed, I can phone the local hospice charity shop who will come and collect from the house, but I don't like to trouble them too often. Hence I was so very grateful to find that the PDSA charity sack delivered last week stated that they would collect not only clothing but bric a brac and books too. I do appreciate that books are heavy and bulky items, but I'm sure if they are priced competitively they will sell. Our local Oxfam shop often has a note on the window saying they can't accept any donations as their stock room is overflowing. So why don't they lower their ludicrously high prices and get more of a turnover?? I know of one charity shop in Bristol that used to regularly have 10p and 20p book sales where hundreds of books would be shifted in one day. They stopped doing that some time ago and now when you go in there you are practically met by a teetering wall of books, all smelling fausty and damp and with terribly creased covers. And with prices starting at £1.50 for a small paperback I wonder why they never seem to sell any these days! I know that in my small town Monday mornings during the car boot season are very fraught for the charity shops as often people dump their unsold stuff from the weekend's car boot sales outside the shops on a Sunday afternoon. Thus giving loads of time for local yobbos to strew the items liberally around the road, and for the local stray dogs to have a good old wee on it all. However, I was somewhat surprised this morning when somebody brought in neat boxes of what looked to me like perfectly good items to the charity shop I happened to be mooching around in. and after they had gone out the manageress announced in a very loud tone that it was all total rubbish as it had been left over from yesterday's car boot sale. Frankly, my fingers were itching to have a good rifle through the boxes as the stuff all looked saleable to me. The phrase 'one man's trash is another man's treasure' went through my mind as I left the shop. I'm with you on the terribly rude charity shop volunteers. There is one Oxfam locally, whose door I refuse to darken for that very reason. They were also selling donated padded envelopes for MORE than the stationers. Commerce gone bonkers.